Is it time to buy RGS Energy? RGS Energy (NASDAQ:RGSE) reported earnings yesterday, and the market was none too happy: In afterhours trading, shares dropped nearly 10%. Shares have been extremely volatile over the past year -- a year in which trading volume has skyrocketed as investors have taken a particular interest in the company, whose business model resembles SolarCity's (NASDAQ:SCTY.DL). While SolarCity continuously proves the viability of its model, many conclude that RGS Energy can follow suit. Based on the recent earnings report and several other factors, I'd agree that the current sell-off represents a good buying opportunity. Since 1978, when the company began operations, it has designed and installed over 16,000 residential and commercial systems, making it the fifth largest U.S. residential PV installer through Q3 2013 according to GTM Research. The company has demonstrated its commitment to growth through acquisitions most recently with Mercury Solar Systems. Providing RGS Energy with greater opportunities to operate on the East Coast, the all equity transaction resulted in the addition of $10 million in cash to the company's balance sheet and no debt. The deal affords RGS Energy the opportunity to expand its presence in the Northeast commercial and residential markets. Another recent acquisition, meant to strengthen the company's position in the residential market, was Syndicated Solar. The deal provides RGS Energy with the ability to expand its presence in California and Colorado and enter into the Missouri market. Oftentimes, companies are eager to engage in acquisitions at the risk of taking on too much debt. 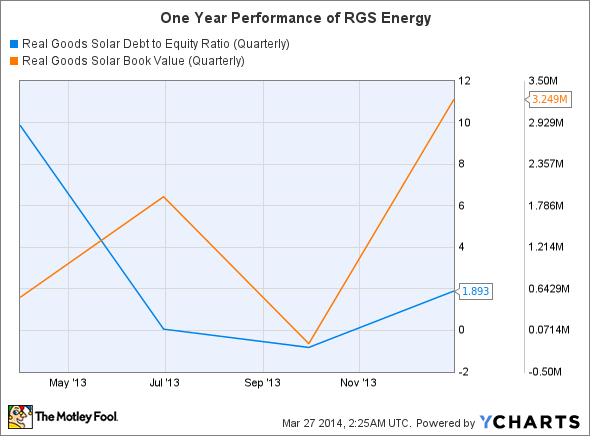 This doesn't seem to be the case with RGS Energy, whose debt-to-equity ratio has improved over the past year. Far gone are the days when homeowners, interested in going solar, needed to buy their systems for tens of thousands of dollars. They can now choose from a variety of options, including going solar with no money out-of-pocket, simply paying a discounted electricity rate for a set term (usually around 20 years) to the third-party. RGS Energy is no different in offering this option to its customers; however, it is setting itself apart in other ways. Earlier in March, the company announced a partnership with Mosaic to offer the Mosaic Home Solar Loan. According to the company's press release, "The new loan program represents a very simple and affordable means for American homeowners to finance ownership of their residential solar systems." The first of its kind, the Mosaic Home Solar Loan does not require homeowners to put any money down. Instead, like a solar lease, they make simple monthly payments, but, unlike a solar lease, the result is ownership of the system. As successful as the Mosaic deal was for RGS Energy, the company doesn't plan on resting on its laurels. Management expects "the development of an in-house lease program and expanded financing capabilities to support a strong foundation for growth in 2014." This is essential to the company's future success, for subsidies and rebates have begun to wane in some markets, and they will only continue to wane further in the future. Offering innovating financing options will ensure that RGS Energy remains an attractive option for prospective homeowners. For the full year 2013, RGS Energy delivered some commendable results. On the top line, net revenue was $101.3 million -- a 9% improvement over the $92.9 million in 2012. Although the company's gross margin was 22%, down from 24.8% in 2012, operating expenses showed improvement: $31 million in 2013 compared to $36.9 million in 2012. The company attributes the improvement to lower customer acquisition costs and a continuing effort to increase operating efficiency. On the bottom line, the company also showed improvement. Net loss in 2013 improved to $11.3 million or $(0.38) per share, compared to a loss of $47.2 million or $(1.77) per share in 2012. The company has refrained from providing specific guidance for 2014, but it has stated that it expects total deployments for the year to fall in the range of 50-55 MW -- a substantial improvement over the 35 MW it deployed in 2013. With a $5.5 billion market cap, SolarCity dwarfs RGS Energy, which weighs in at a market cap of $141 million. So what? This is no winner-take-all game; there will be plenty of success stories in this epic energy tale. The coming year certainly shows no signs of slowing down. According to the Solar Energy Industries Association, nearly "6,000 MW of PV are forecasted to come online throughout 2014, which represents 26% growth over 2013's record installation totals." RGS Energy may only lay claim to a small portion of that during 2014, but that's not to say that the company won't be a big winner in the long term.